This sweet little framed picture is more than just art on the wall. It’s a throwback to the pixel art of the past, with a bit of a high-tech twist. 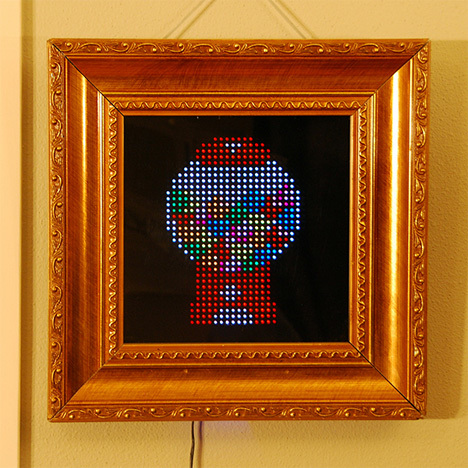 PIXEL is an interactive picture frame that displays pixel art and animations via LEDs hidden behind a two-way mirror. PIXEL was created by Al Linke, who is raising funds on Kickstarter to start producing the cool toy. The display is made up of 512 or 1024 LEDs (depending on the model you have). Images are created by changing the colors and brightness of each LED – kind of like next-generation Lite Brites. The pictures and animations are controlled by free Android apps – there is currently no iOS version, but that may change in the future. Linke worked with several pixel artists to create art just for the PIXEL project, but you can also display your own pixel art creations. When you want to change the art on your PIXEL, you just choose the picture or animation from your Android device and the change is communicated to the PIXEL via Bluetooth. The entire project is open source, meaning that developers are free to create their own art and other functions. One of the coolest features of PIXEL is its proximity sensor. With certain art, the picture or animation changes once someone steps close to the frame. This function can be used to play games (like a Magic 8-ball app) or just to surprise unsuspecting visitors. When the device is not in use, the PIXEL just looks like a regular mirror hanging on the wall. As seen above, there is an app called Complimentary Mirror that uses the proximity sensor to sense when someone is gazing into the mirror and give them a confidence-boosting compliment.